It’s almost my two-year knitting anniversary! Well, actually, I embarked on my first knitted project about ten years ago and made a VERY tortured scarf — but late-November 2015 marks when I moved past that trauma and picked up the needles again, this time when I began working on the shop floor of Tolt Yarn & Wool. Feeling more confident and abundantly supported, I took to it like a fish in water. I found ‘my thing’. I’m almost positive that fall/winter are every knitter’s favorite seasons; when the temperatures start to dip below 50°F, every second spent bundled up in that lace-weight oversized shawl seems worth it, no matter how frustrating or joyful it was in the process! (top row, l to r) Guernsey Triangle by Jared Flood, in the ‘wool socks’ deep-red colorway that always steals my heart. Basic Sock by Churchmouse, seen here x4 pairs… the best no-fail vanilla-sock pattern I’ve come across to date. (bottom row, l to r) Strokkur by Ysolda Teague, my second sweater and first color work project. By far the best shaping I’ve come across for a Lopi sweater ever! Thankfully, I just cast off my boyfriend’s sweater (good riddance! but not really… but sorta…) so I can finally indulge in one or two projects for myself. You know, Christmas presents to ME, right? Little Twigs by Melody Hoffman is so fun! Looks like a breeze to knit and certainly a wardrobe staple. Meg sweater by Junko Okamoto. If you love oversized sweaters, this designer is for you! 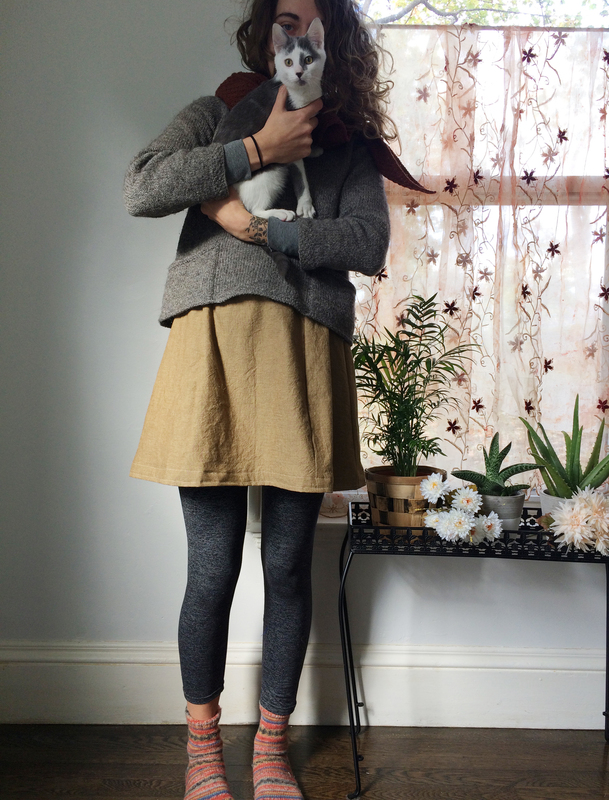 I’d probably choose a yummy light grey yarn to match all my other light grey sweaters. I’m headed to Purl Soho this weekend, so I’m going to pick up yarn for these Stockinette Hand Warmers that look reaaaalllly fast and very satisfying. 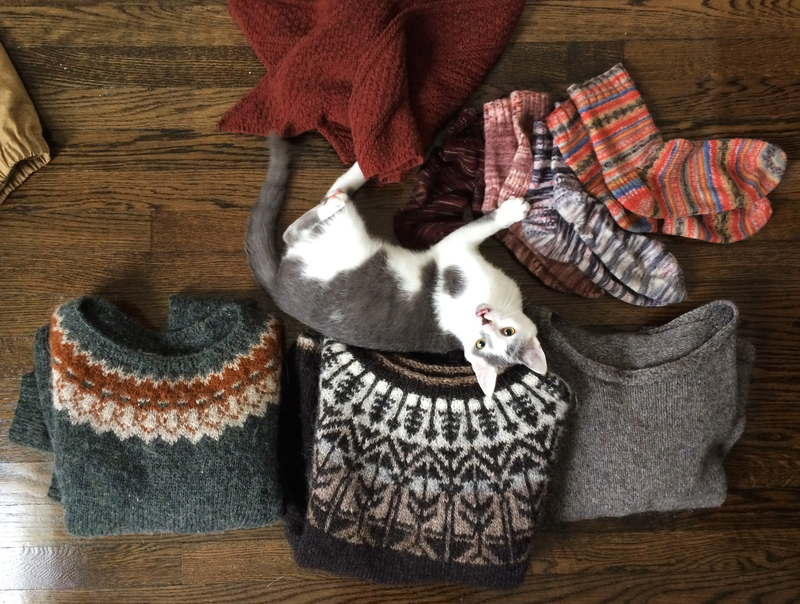 What are some of your favorite go-to knits, garments that you can’t live without, or greatly anticipated projects? Any knits that you can’t WAIT to show off at our June gathering next year 😉 I would love to hear what you’re working on! As I mentioned, we’re heading off to Brooklyn this weekend — Elizabeth + I are taking a day to explore Renegade Craft Fair — and I’m feeling so grateful for the abundance and opportunities made available to me. Thank you, thank you, thank you. « when my hands couldn’t get ANY fuller, here comes Basil!